Quick Step & Side Kick is the third studio album by the British synthpop group Thompson Twins. It was released in February 1983, and was their first album to be released as a trio (the band consisted of up to seven members during previous releases). The album reached no. 2 on the UK Albums Chart and was later certified Platinum by the BPI. 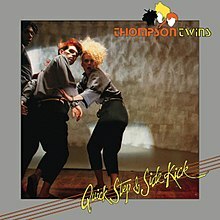 In the United States and Canada, the album was titled simply as Side Kicks, and was only the second Thompson Twins album to be released there. The album was the first collaboration between the band and producer Alex Sadkin and was recorded at Compass Point Studios in the Bahamas. The singer Grace Jones (who had worked with Sadkin on three of her albums by that time) made a guest appearance on the track "Watching", though her vocals were not included on the track when it was remixed and released as a single in mid-1983. The album has several different versions according to different territories, containing different tracks and different track order. The UK and US cassette versions of the album also contained a whole side of remixes of various album tracks. Reviewing the album in Record magazine, Crispin Sartwell noted that the songs "Love On Your Side", "Tears", "Love Lies Bleeding", and especially "Lies" achieved a funk that could appeal to both black and white listeners, but that the songs on Side Two of the record veer more towards the pretentious music of their first two albums. He nonetheless concluded the album to be one of the best examples of British funk to date. "Love On Your Side" - 4:25 UK / 3:33 U.S.
"Love Lies Fierce" - 6:45 (Dub remix of "Love Lies Bleeding"). In March 2008, Quick Step & Side Kick was reissued as a 2-disc set by Edsel Records and included the bonus remixes that appeared on the original 1983 cassette version of the album. The second disc included most major 12" versions and B-sides, some of which appeared on CD for the first time. "If You Were Here" was used as the ending theme for the film Sixteen Candles. It was later featured in the Bob's Burgers episode "Sheesh! Cab, Bob?". It also featured in "Hell Week", episode 2 of Scream Queens. As well as in the film Not Another Teen Movie. Also the ending song in Fun Mom Dinner and central intelligence. "Love On Your Side" was featured on the in-game radio station "Wave 103" in Grand Theft Auto: Vice City Stories. "Lies" was featured in the Regular Show first-season episode "Grilled Cheese Deluxe." "Kamikaze" was used in Cipher the Video, an anime adaption of the manga Cipher by Minako Narita. Boris Williams - cymbals on "If You Were Here" & "Tears"
Grace Jones - background vocals on "Watching"
Monte Brown - guitar on "Watching"
^ Erlewine, Stephen Thomas. "Quick Step & Side Kick – Thompson Twins". AllMusic. Retrieved 12 June 2018. ^ Peel, Ian (2008). "Thompson Twins: Quick Step & Side Kick / Into the Gap". Record Collector: 101. ^ Considine, J. D. (14 April 1983). "Thompson Twins: Sidekicks (Quick Step & Sidekick)". Rolling Stone. Archived from the original on 12 May 2006. Retrieved 12 June 2018. ^ DeCurtis, Anthony; Henke, James; George-Warren, Holly, eds. (1992). "Thompson Twins". The Rolling Stone Album Guide (3rd ed.). Random House. ISBN 0-679-73729-4. Retrieved 29 September 2012. ^ Sumerside, Angie (3 March 1983). "Thompson Twins: Quick Step & Side Kick". Smash Hits. 5 (5): 41. ^ Sartwell, Crispin (June 1983). "Side Kicks review". Record. 2 (8): 27. This page was last edited on 9 April 2019, at 22:29 (UTC).